The Kenyan voter is one of the most politically informed and politically conscious voters compared to most democracies. Interestingly, the Kenyan voter also wins top prize when it comes to irrational decision making. You could say it rational decision making if you wish. In the land called Kenya, rational thinking lies on the bedrock of ethnic calculations. Under such circumstances, logic and reality takes back stage is substituted with emotional and short term solutions. The political awareness amongst most Kenyan voters stems from the media that is full of political diet on the front page. The ubiquity of political news on Kenyan newspaper is as a result of a society that is highly politicized. Yet it is difficult to understand why Kenyan awareness of political affairs has not resulted into an effective democratic society. We have metamorphosed into a society that allows the political class to get away with the crappy policies that they pass without much ado. In some cases, the decisions that are made are directly impacting our daily lives, in much acute ways, still as political as we are; we always rubbish voices of dissent in the strongest ethnic terms. We are a confused society. Last week, thirty-seven Nyanza legislators met at Raila Odingaâ€™s home in Bondo to discuss the impact of Nairobi Governor Evans Kideroâ€™s many harambees in Nyanza. The thinking was that Kideroâ€™s actions were suspicious. The leaders, although denying this argument, felt that Kidero was preparing himself as a potential rival to the defacto leader of the â€œLuoâ€ community. Now, several questions arise out of this argument. First, it is in order to understand that the Harambees were made for the sole purpose of improving the welfare of the people. What is more important, development or politics? Leaders are elected to make laws that initiate development projects and not to policies throughout the five years. A section of Nyanza residents on social network debated this issue, most of them younger than 35 years, jobless, college students or high school students. You should have been ashamed how a section castigated Governor Kidero for his actions. Kidero was their enemy and the likes of Kajwangâ€™, Mbadi, and Jakoyo were the friends. One would think that even if Kideroâ€™s actions were political, then it was the right thing to do. 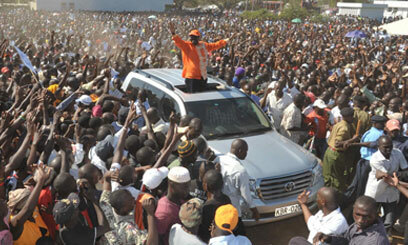 ODM prides as a champion for democratic ideals, and this means that it should encourage healthy competition. No one elected Raila as the leader of the Luoâ€™s. The Luoâ€™s have never had a King; the society has solved its problems on democratic platform and constitutions commonly known as â€œChikeâ€ since time immemorial. Another example of emotionalism is demonstrated by supporters of President Uhuru Kenyatta and his foes alike. Our president is loved and hated in equal measure. I have an indifference feeling towards the son of Jomo. As a president, I think he has the record of one of the most ill- performing president of Kenya in the first 8 months of office. Moiâ€™ did much better. Facts speak. Yet, this reality is often a subject of great debate lying on self-destructive ethnic base. When Uhuru â€œgagged the mediaâ€, most Kenyanâ€™s felt it was too much. However, a few Jubilee supporters actually felt it was the right thing to do. The Media was bad. The president term is only 5 years, what happens when the president leaves office, and another president come, will the same people still support a society with limited press and media freedom? It is right if our Man does it, it is wrong if he doesnâ€™t, is that what Kenya want? Which country are we building? Will our children be proud of us? I donâ€™t think I have an answer, but I think Kenya is graduating to the level of collective psychopath syndrome. We are becoming a self-destructive society, and ethnic politics is the cancer that is consuming our middle class, academia, and Minds. Yes, an immediate change is the chemotherapy that we need. Uhuru Kenyatta, William Ruto, Raila Odinga and Kalonzo Musyoka are not the cancer doctors that we need.